I've got a guilty secret. I like pork scratchings. Until recently, every day on my way home from the Blacking Factory (a quasi-heated, cavernous warehouse found in the scrappy, semi-industrial inner suburbs of North London), I would pull over at a garage on the A40 and buy a packet of Mr Porky's Pork Scratchings. It was sort of addictive. I kept this one quiet from Mrs Aitch, carefully removing the greasy, empty packet from the floor of the car before bounding up the steps to our shiny, Grecian knockered front door. You see, it's been a sort of secret love affair over the years- I mean with the Pork Scratchings. If you're not British, you probably don't know what I'm talking about. Pork Scratchings are off-cuts of pork rind or skin, deep fried in fat, and then sprinkled with salt, flavourings and undoubtably, our old friend monosodium glutamate. They have a dodgy reputation; they're about as classy as a Knees Up Mother Brown at the local dog track. Those on a diet can look away now. But now and again, you would run into tantalising, if raffish, home-made versions. The Star Tavern in Belgravia (that excellent traditional London pub; the former haunt of the Clermont gambling set and the Great Train Robbers) sold fresh scratchings, cooked to their own recipe, salted and presented in large glass jars, into which you could plunge your grubby mitts. I liked this. And now, at last, Pork Scratchings can truly come out of the cold. Tom Parker Bowles, Matthew Fort and pig-farmer, Rupert Ponsonby, are the brainchildren behind a new venture: Mr Trotter's Great British Pork Crackling ('Hand Cooked For a Crisper Crunch'). I'm munching on a packet as I write this, it's a sort of manly, substitute breakfast. According to the packet, "it's seasoned with a special blend of ingredients, without a trace of MSG. Unlike other pork scratchings, Mr Trotter's Great British Pork Crackling is made with 100% prime British pork skin from the finest British Pigs". They are indeed divine, and far less salty than the more ersatz brands. It's also nice to know that British pigs are being turned into scratchings- sorry boys, crackling, rather than Danish beasts. My only sorrow is that currently, they only seem to be available at the usual up-market parade: Harvey Nick's food hall, Fortnum's, the Chatsworth Farm Shop. But you can, at least, buy them online, and in bulk (£57 for 30 bags, if you're wondering). I quite like the idea of a pork scratchings hoard; in this case, there's going to be no need to keep it a secret. I like the word "Zucchini". It rolls off the tongue. Here in England we call them "courgettes". Anyway. If you've got the time and inclination, zucchini fritters are the perfect thing to serve with drinks, and especially with a Dry Martini. 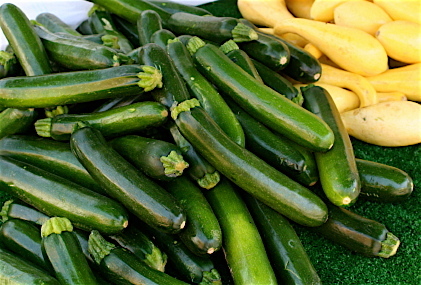 I'm currently keen on the idea of tiny fritters; the size of a small coin: slice up some baby courgettes very thinly, put the slices into a colander, and sprinkle them with sea salt. The salt will draw out enormous quantities of water. Your friends will be thrilled and amazed. Next, beat an egg white until frothy, and dip the courgette slices into the egg white. Shake off the excess, and then dip them again into strong flour which you've previously seasoned with salt and white pepper. In a deep-fat fryer, heat some peanut oil to about 375 F (190 C). If you don't have a fryer, use a wok. As nut oil burns at a higher temperature, it's an excellent choice for this sort of operation. Drop the courgettes into the oil, a few at a time, and fry them until they are crisp. Watch them like a hawk, and make sure they don't burn. Incidentally, when frying, it's always best never to overcrowd the pan; if you do, you run the risk that your food may steam or boil, which, of course, is a different technique all together. Drain the fritters on kitchen paper, and sprinkle them with more salt and pepper. Okay, this means that your fritters are going to pretty salty, but I think that in this case, it provides a perfect balance with the dry oiliness (is that a word?) of a classic Martini cocktail. I also quite like the idea of cutting up the courgettes into wider slices, and serving them in that simple way, as a side dish. Baby yellow courgettes could be an interesting concept, too. Lots of ideas. If you've got the time and inclination, courgette (or zucchini) fritters are the perfect thing to serve with drinks, and especially with a Dry Martini. I find it best to use baby courgettes, so that you end up with fritters the size of a small coin. Slice the courgettes very thinly, put them into a colander, and then sprinkle them with salt. The salt will draw out the water. You will be amazed by how much water drains off. Next, beat an egg white until frothy, and dip the courgette slices into the egg white, shake off the excess, and then dip them again into flour, which you have previously seasoned with salt and black pepper. In a deep-fat fryer, heat some peanut oil to about 375 F (190 C). If you don't have a fryer, use a wok. Nut oil burns at a higher temperature, and so is an excellent choice for this sort of operation. Drop the courgettes into the oil, a few at a time, until they are crisp. Watch them like a hawk, so that they don't burn. Incidentally, when frying, it's always best never to overcrowd the pan; if you do, you run the risk that your food may steam or boil, which, of course, is a different technique all together. Drain the fritters on kitchen paper, and sprinkle them with more salt and pepper. Okay, this means that your fritters are going to pretty salty, but I think that, in this case, it provides a perfect balance with the dry oiliness (is that a word?) of a classic Martini cocktail. I'm back in the Big Smoke. You may remember that I was planning to write about whitebait. I cooked some on Saturday. They were delicious (deep fried in Cayenne pepper, and coated with a dusting of seasoned flour) but the photography wasn't that hot; so as Hallowe'en is almost upon us, I'm going to concentrate on some classic Hallowe'en dishes over the next few days instead. Hallowe'en is interesting. When I was about so-and-so high, it was barely celebrated in Britain; all the emphasis was on Bonfire Night a few days later. In those far off days, Trick or Treating was just not the done thing in Jolly Old. I suspect that Hallowe'en was originally brought to the United States by Scottish or Dutch settlers in the nineteenth century, became a big deal over there (Hallowe'en post cards were huge in America before the First World War) and then in the last few years with the Americanisation of Europe, came back over here. Not that I'm complaining. It's a bit like Chop Suey, which, apparently, was re-invented by Chinese immigrants in San Francisco; the European Coffee House in Seattle (er- Starbucks), or the deep-pan "Italian" pizza re-gurgitated in Chicago from the classic Neopolitan street recipe. Old World classics go to America, are re-invented, and then make their way back here with a bit of North American perzazz thrown in for good measure. Here's a good 'un for the Night of the Living Dead: they're called Devils on Horseback. You get hold of some rashers of streaky bacon and half-cook them under your grill. The night before, you've soaked some dried prunes in water and Lea & Perrin's Worcestershire Sauce. 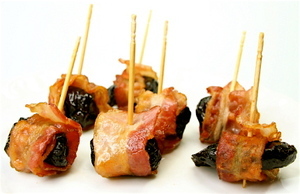 Now wrap each bacon rasher around a prune, and fasten with a wooden cocktail stick. You are going to re-grill them, so it's a good idea to soak the cocktail sticks in cold water first- to stop them burning. Bung them back under the grill, until they are cooked through. Take them out. Season with salt and pepper, and if you're up for it, a further dash of Lea & Perrins. Serve with hot toast and a watercress garnish.